Versatility is becoming more and more important throughout the automotive industry, with new model lineups now often featuring gas-powered models, hybrid models and electric models with a wide variety of engine options and body styles to choose from. 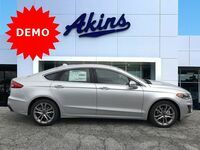 But perhaps no other lineup in the industry better exemplifies this new versatility trend as much as the 2019 Ford Fusion lineup at Akins Ford near Atlanta, GA.
That’s because the 2019 Fusion lineup has a model for everyone – no matter what they’re looking for in a new sedan. In fact, the 2019 Fusion lineup features both gas-powered models and hybrid/electric models to go along with four different engine options – an engine lineup that includes both inline 4-cylinder and V6 engine options. Add to that the 2019 Fusion lineup’s roomy interior and spacious trunk and you’ve got the perfect choice for anyone in the market for a new sedan. To show you what we mean, we put together this 2019 Ford Fusion versus 2019 Chevrolet Malibu head-to-head model comparison. 175 HP & 175 lb-ft. Standard Horsepower & Torque Ratings 160 HP & 184 lb-ft.
325 HP & 380 lb-ft. Max Available Horsepower & Torque Ratings 250 HP & 260 lb-ft.
We talked a lot about the versatility of the 2019 Ford Fusion lineup in our introduction – more specifically, the versatility of the 2019 Fusion lineup’s engine options – so let’s begin things under the hood. The standard engines of the two lineups are pretty similar, with the 2019 Fusion offering more standard horsepower and the 2019 Malibu offering slightly more standard torque, but the 2019 Fusion lineup takes off in a big way when looking at available power thanks to its V6 engine option. The interior passenger space of the two models is as close to identical as you can get, though the 2019 Fusion lineup features a larger trunk than the 2019 Chevrolet Malibu. If you’d like to learn more about the 2019 Ford Fusion lineup, please contact our staff here at Akins Ford near Atlanta, GA.